Starting from the East Coast, take control of a pioneer railroad company to build routes, pick up valuable cargo, and deliver needed goods to growing towns. Along the way, gain shares in other railroads and watch your reputation soar with each successful delivery. Then make a final push to complete long hauls to the boom towns of the West. To be the player whose railroad scores the most fame points. 1 Put the gameboard in the center of the table. 2 On the turn track, place 1 whistle token per player on the whistle space. Then find the coal space with a number of pawns that matches the number of players you have. Starting with that space and working down, place 2 coal tokens per player on each coal space. 3 Put the gold tokens (shuffled with the numbers face down), coal tokens, whistle tokens, and resource tokens one side of the board. (4 )Create a stack of each railroad share type on the side of the board. Stack each type in numerical order with the number 1 share on top. 5 Shuffle the Upgrade cards. Draw 2 more cards than there are players, and put them faceup near the board. 6 Shuffle the 10 end tiles (dark green tile back). Place 8 tiles faceup in the leftmost column on the game board, and put the other tiles back in the box. Separate out the 18 special tiles: 10 Town, 2 Coal Yard, 2 Trading Post, 2 Whistle Factory, 1 General Store, 1 Gold Mine. 7 Choose 1 Coal Yard, 1 Trading Post, 2 random Town tiles, 1 other random special tile (not a Coal Yard, Trading Post, or Town) and 3 random ordinary train route tiles. Randomly place these 8 tiles faceup onto the board in the fourth column from the right. 8 Randomly choose 9 ordinary train route tiles and place them randomly faceup into the rightmost column and in the topmost and bottommost positions of the second column. Tiles cannot be placed in an orientation that results in the only continuing route going backward. 9 Shuffle the remaining special and ordinary tiles together. Place the stack of tiles facedown near the board. Turn 3 tiles faceup next to the stack. Each player takes 1 whistle token and 3 random tiles from the stack. If at least one of your tiles does not have a stop on it, discard a tile and draw another until you have one stop in your hand of tiles. Choose a player color.Take a number of trains in your chosen color: 5 trains in a 2-player or 3-player game, 4 trains in a 4-player game, and 3 trains in a 5-player game. Put unused trains back in the box. In addition, place your circular score marker on the 0 on the scoretrack on the edge of the board. Randomly choose a start player. Then take a number of coal tokens according to player order: Start player, 2 coal; 2nd player, 2 coal; 3rd player, 3 coal; 4th player, 3 coal; 5th player, 4 coal. Starting with the player to the right of the start player and continuing counterclockwise, take turns, one at a time, to place your trains on one of the 16 east coast stops, until all trains are placed. An east coast stop can contain, at most, one train. 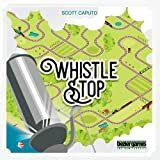 Whistle Stop is played in rounds, marked by the turn track. When the start player distributes tokens from the turn track, a new round begins. At the beginning of each of his turns, the start player distributes all tokens on the next filled space on the turn track evenly among all players, including himself (1 whistle token or 2 coal tokens per player). Then he takes the rest of his turn normally. Spend up to 4 tokens (coal or whistle) to move your train(s). Spend resources to gain up to 2 upgrades. You may do all, any, or none of these, in any order. You may only move your own trains, not another player's. As you spend tokens, place them on your player board in the four numbered spots to keep track of your spent tokens. Then at the end of your turn, return the spent tokens to the supply. For the first round, the start player takes the tokens off of the coal space next to the number of players you have. Spend a coal token to move one of your trains along the track west (left) to a new column, or up or down within the same column. End movement at the next stop along the track. A train may not use coal to move back to a stop in a previous column. A train must follow the railway track on the tiles. A train may not move to a resource stop or east coast stop (small circles) where there is an opposing train. Any number of trains may be on all other stops (large hexagons). A train may travel across any number of tiles to reach the next stop. Your train may pass through (but not end movement on) resource stops or east coast stops occupied by another of your trains. Place a train that has reached an end tile on a resource track immediately (it may not move out of an end tile). 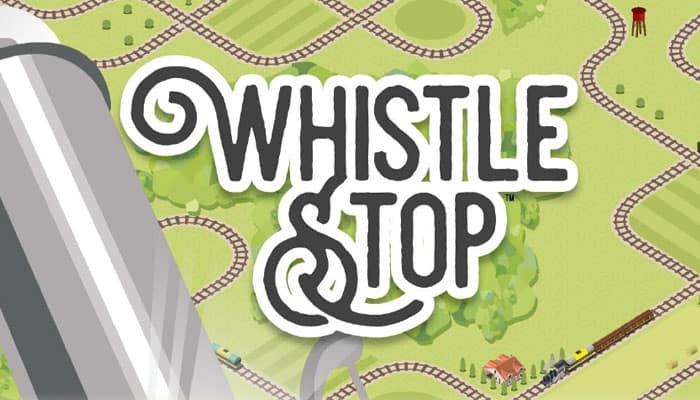 Spend a whistle token to move one of your trains one or two stops in any direction, including ending on a tile to the right of where it started. Do not collect any resources or tokens for skipped stops. You may pass stops that are occupied by other players. If you use a whistle token to skip over an end tile, skip all effects of that end tile as well. Place a train that has reached an end tile on a resource track space immediately (it may not move out of an end tile). If movement sends your train on a track that leads to an empty space, play a tile from your hand into that space and follow the track onto it. If that tile does not have a stop to end your train's movement, play a second tile from your hand and continue your train's movement onto that tile. If that still does not provide a stop to end movement, play the third tile from your hand to continue movement. Placement of the third tile must end your train's movement at a stop. When your train lands on a resource stop (a circle with a cube in it), gain one resource of that color. Resources gained by any of your trains are available to all of your trains for delivery or trading purposes. Three resource types (cotton, gravel, lumber) are common and three resource types (cattle, whiskey, and steel) are rare. Rare resources appear less often than common resources. You may hold a maximum of 10 resources. If you have 10 resources, you must discard a resource to collect a new one. any 1 common resource for any 1 common resource, 1 whistle token, or 2 coal tokens. or any 1 rare resource for any 2 common resources or any 1 rare resource. When your train lands on a Coal Yard stop, gain 2 coal tokens. When you land on a General Store stop, gain 1 resource of your choice. When your train lands on a Town stop, spend the resources shown on the tile to gain the fame point bonus and the top card of the railroad share named on the tile. If you do not spend the resources, lose the listed number of fame points and gain no railroad share. If you have 0 fame points, a point penalty has no effect on your score. You may visit the same Town stop multiple times with the same or different trains. Spend resources to gain the bonus or suffer the penalty each time separately. A player may have multiple railroad shares of the same type. If there are no more stocks for a town tile, you may still go there, and receive the points for spending resources (or lose points if you do not spend the resources). When your train lands on an end stop, spend the resources shown on the tile to gain the fame point bonus on the tile. If you do not spend the resources, you lose the listed number of fame points. Then remove your train from the board and place it on any empty space on the resource track. 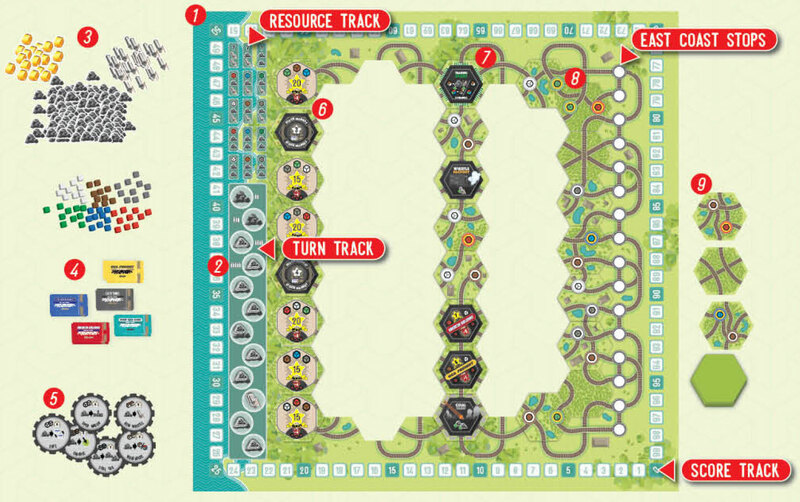 Gain the resources and/or tokens shown on the space where you place your train. For a "? ", you may take any 1 resource or token (Coal, Whistle, Gold) of your choice. When your train lands on a Gold Mine stop, gain a gold token. It will be worth 3,4, or 5 fame points. Look at it, and keep its value facedown and hidden until the end of the game. When your train lands on a Stock Market stop, gain the listed number of fame points for each railroad share you have. You must then remove one of your railroad shares from the game. When your train lands on a Whistle Factory stop, gain 1 whistle token. At the end of your turn, refill your hand up to 3 tiles from the faceup tiles or the facedown stack. After taking replacement tiles, make sure there are 3 faceup tiles next to the tile draw stack. Then play passes to the left. When it is the start player's turn again, he distributes the tokens on the next space on the turn track before his turn begins. On the last round of the game, you may skip refilling your hand. If you cannot or choose to not move on your turn, gain 1 whistle token and forfeit all movement for the turn. You may still upgrade if you wish. You may purchase up to 2 upgrade cards at any time during your turn. To purchase an upgrade from the supply, spend the resources shown at the top of the upgrade card, then take the upgrade and place it in front of you. To purchase an upgrade card from another player, spend the resources shown at the top of the card, then pay a rare (red, green, or blue) resource of your choice to the player who owned the upgrade. Then take the upgrade and place it in front of you. The number in the star is the fame points you gain if you own this upgrade at the end of the game. Many upgrades let you spend coal to do special actions. You still may only spend up to 4 tokens on your turn, though you could spend all 4 tokens to use special actions. Spend a coal token to gain 2 coal tokens. Spend a coal token to do 2 trades using the same trading rules as the Trading Post. Spend a coal token to receive a facedown gold token. Another player must pay you 1 resource of his choice to leave any stop where you also have one or more trains. If a player cannot pay, his train cannot move. When refilling your hand, you may look through the tile stack and choose a tile. Put the tile in your hand, and reshuffle the stack. Spend a coal token to score 4 fame points for every 3 shares you own. No other player may move a train into a stop where you have a train. If another player's train is already on a stop when you purchase Blocking Signal, that player's train may stay. Spend a coal token to use a stop that your train is on again without leaving it. This includes special stops and deliveries. Spend a coal token to swap one of your stocks for any unclaimed stock of a placed Town tile. Remove your swapped stock from the game. You may not swap for the stock of a Town not on the board. Spend a coal token to gain any 1 resource token. You may immediately increase your hand size up to 5 tiles. With a larger hand size, you may play up to 4 or 5 tiles to move a train on the board. Just as before, the train must end its movement at a stop by the playing of the 5th tile. If another player purchases Extra Boiler from you, you must immediately discard from your hand to the bottom of the face down tile stack to 3 tiles. You receive no end game penalties for any Town or special tiles in your hand. Spend a coal token to gain a whistle token. The game ends at the end of the last round, or at the end of the round during which one player gets their last train off the board. For each type of stock, the player with the most shares of a type scores 15 fame points. In the event of a tie, among the tying players, the player with the lowest stock number is the majority stock holder. Score points for any upgrades you own. Score the fame points shown on each gold token you have. Score 1 fame point for each unused common resource token you own. Score 3 fame points for each unused rare resource token you own. Score 1 fame point for each two tokens you have. Lose 10 points for each special tile in your hand. In the case of a tie for most points, the player with the most total number of railroad shares wins.